This is one of many reasons why Ric Grenell should be our next Ambassador to the UN: Just as with Nikki Haley, he speaks the truth. 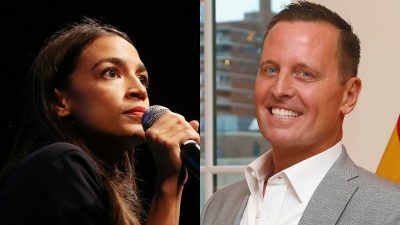 Grenell’s comments on Fox News’ “FOX & Friends” came after Ocasio-Cortez said at a campaign event on Friday that the blueprint the United States used to defeat Nazi Germany is the same blueprint that needs to be used to defeat global warming…. Grenell has a strong record of fighting against Nazism as he played a key role in the Trump administration’s deportation of “95-year-old Jakiw Palij — the last known Nazi collaborator living in the United States — at his home in Queens, New York,” over the summer…. We need more stands like this.